Rotary Club of Basildon Concord - Welcome! The Rotary Club of Basildon Concord, held it's annual "Hand-over" dinner at the Holiday Inn, Basildon on Wednesday 29th June. Also appointed to their positions were two other lady members - Kate Gregory, who will be the 1st Vice President until she takes on the Presidential role in July 2017, and Joanne Phillips the 2nd Vice President who will follow the year after. 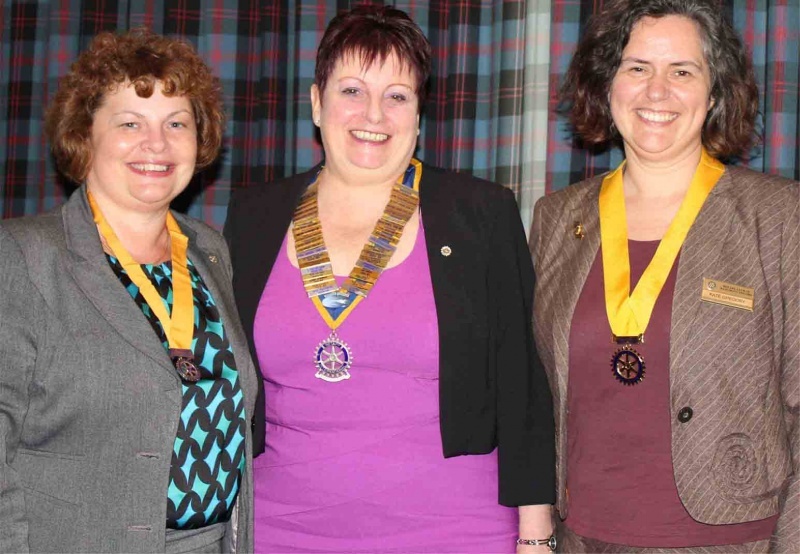 Outgoing President Danny Lovey said " It is splendid that we not only have a very capable incoming Lady President in Alison, but both Kate and Joanne in the wings to follow her. The Club has only had lady members for a few years now, but their progress has been excellent and I am absolutely delighted in their appointments and will do all I can to assist them "
Incoming President Alison Messham - in her acceptance of her presidency, said how delighted and proud she was to be appointed President and pledged to work hard for the benefit of Rotary and the Club during her year of Office. This year the Club again entered into the spirit of Christmas and displayed our Christmas Tree at the St Martin's Church Christmas Festival along with 30 plus other organisations in Basildon. A fun evening with around 110 Guests at The Holiday In, Basildon on Friday were entertained by an all star line up of tribute singers includng, Dusty Springfield, Frankie Valli, Dolly Parton and Kenny Rogers ablely supported by by 'Keeley' who did her own selection of her favorite songs by legends such as Patsy Cline, Brenda Lee, Connie Francis and others. The Dinner Dance & Cabaret show was in aid of The Papworth Trust and Rotary Charities in an evening organised by the Club and the local management of the Holiday Inn, Basildon. 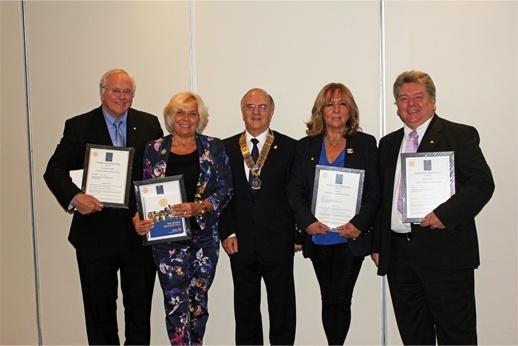 At a recent Club meeting at the Holiday Inn Basildon, the Club President Danny Lovey inducted four new members to the Club. Wednesday 29th July at the Holiday Inn Basildon, saw the Rotary Club of Basildon Concord have as their guest speaker Jo Revitt of the Papworth Trust. 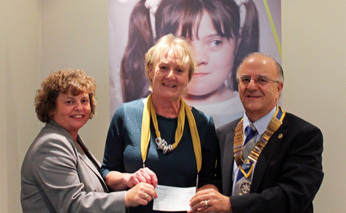 After Jo's presentation to the club, she was presented with a cheque for Â£500 in favour of the Papworth Trust, in a joint donation between the Concord Rotary club and the Holiday Inn Basildon, who had together run a function for them. Club President, Danny Lovey, thanked Jo Revitt for her inspiring presentation and said that "The Papworth Trust are worthy of a higher profile in our community for the outstanding work they have done for the disabled in the local area over many years and who will continue to do so". Jo Revitt, said " Papworth Trust is a leading disability charity. Our vision is a world where disabled people are seen for what they can do, and our mission is for disabled people to have equality, choice and independence.Our work includes providing a range of high quality services for disabled people and campaigning for changes that disabled people want. Joanne Phillips on behalf of the Holiday Inn Basildon added, "we are very proud to have Papworth as our nominated charity this year, to help them raise much needed funds for a very worthwhile cause"
Seen presenting the cheque in the photograph is Joanne Phillips, Sales Manager, Holiday Inn Basildon, Jo Revitt and President Danny Lovey of Basildon Concord Rotary Club. 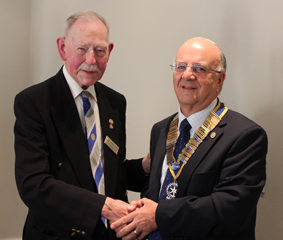 Wednesday this week was ‘handover evening’ when the outgoing President of the Club handed over the reins for the next Rotary year to the incoming President. Outgoing President John Puddefoot, who had served now as the Club President three times, presented the chain of office to the incoming President Danny Lovey, who was to hold the post for the second time. President for the next 12 months. Danny said that he was pleased to accept the Presidency and looked forward to helping the club move forward this year and that increasing membership to the club was his main priority. This coming year is the ‘ruby anniversary’ of Concord Club, which makes it a particularly special year. The Rotary Club of Basildon Concord is very pleased to announce that the first ROTAKIDS Club in Basildon has been formed in Great Berry Primary School, in Langdon Hills. After preliminary discussions with the School and then the children, it was agreed to form a RotaKids Club and on Friday 5th June the Club was formally inaugurated. 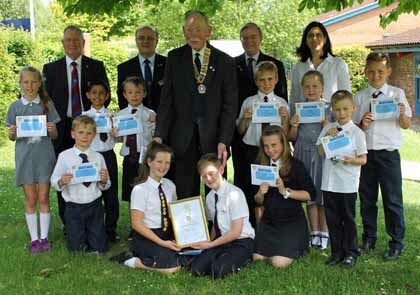 Club President John Puddefoot presented the School with the Charter Certificate signed by the President of Rotary, Great Britain and Ireland, Peter King. He also heard the RotaKids pledge from the appointed RotaKids President Callum, and Vice President Grace, and presented them with their personal certificates and badges. This was followed by the Secretary, Treasurer and 8 more committee members. President John said how proud he was to be presenting the Club with their Charter Certificate and meeting the first members to RotaKIds in Basildon. He wished them every success and said that Concord Club would be there to support them as needed in their endevours.Great Berry Headmaster Damian Pye added how delighted and pleased he was for the School to be working with Rotary in setting up the RotaKids Club. and much more as these are just examples of what the RotaKIds may choose to do. Basildon Concord Club is a small, friendly club of enthusiastic and active volunteers who want to enjoy themselves and give their time and talents to help others. We support many organisations in Basildon that support the needy, be it through an advice centre, food packages or special needs groups. Also, we support individuals both children and others in the community that need help. 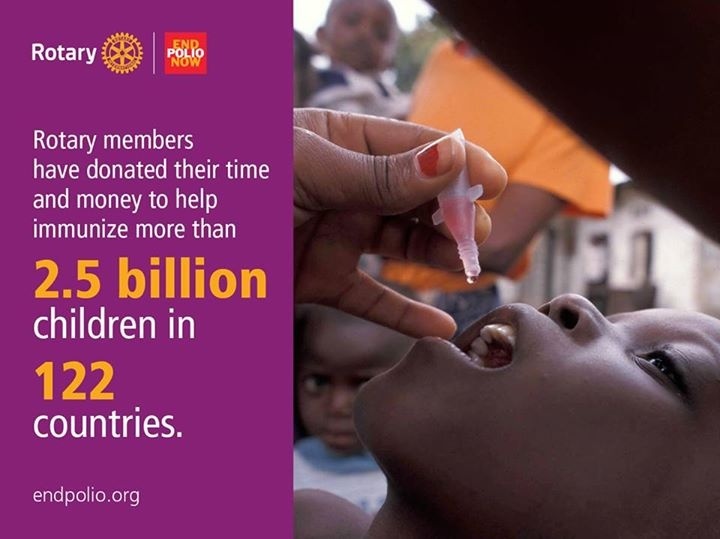 In addition we support Rotary's international projects to help others abroad such as fighting Polio and providing shelter, food and water. You can see us on Facebook as well. Our Club membership is open to both gentlemen and ladies. If you are interested in joining us for fun, fellowship and helping us to help others, why not contact us? Rotary and Send a Cow have worked together for many years. District 1240 in conjunction with the Rotary Club of Kisumu Winam in Kenya and Rotary Foundation are providing livestock for families in this remote part of Africa. SAC provides families with an alternative source of income which enables them to work their way out of poverty and malnutrition. The sale of milk, crops and calves generates income used for schooling, and healthcare. This simple idea has an incredible effect on the lives of people in Africa. Rotary International in Great Britain and Ireland (R.I.B.I.) offer a range of youth activities / competitions and in District 1240 offers many of those activities and competitions. YOUTH SPEAKS– This competition offers a team of three young people aged between 11 to 17 years the opportunity to experience speaking on a public platform. Schools have been supporting this activity for many years. Intermediate Teams – 11-13, Senior 14-17 years old. YOUNG CHEF– Cooking amongst young people is a valuable life skill. Sponsored by Filippo Berio, contestants prepare and present a three course meal within a pre-set budget and a time limit, which is judged by an expert panel. YOUNG MUSICIAN– Music is an international language and we at Rotary encourage talented and young people by providing this opportunity to demonstrate their musical skills. YOUNG PHOTOGRAPHER– Photography is a talent and an ever popular art form. Entrants submit three photographs on a theme in black and white or colour, along with a description of the inspiration for their photographs. YOUNG WRITER– A flair for creative writing is a special gift and this competition promotes and encourages the work of young people who show talent. The winning writers are subsequently published in Rotary magazines. YOUNG TECHNICIAN– Teams of students interested in engineering and science compete in a one day event to devise and build a solution to an unseen technical task. Solutions are tested and judged against competing teams. YOUNG CITIZENS AWARD– These showcase the citizenship and responsibilities demonstrated by people under the age of 25. Winners receive a cash prize of Â£500 at the Rotary Annual Conference where the awards are presented live on the BBC News Channel. R.Y.L.A.– Rotary Youth Leadership Awards allows young people the chance to show their skills over a weekend at the Essex Outdoor Centre on Mersea Island. Leadership qualities are rewarded with certificates and some prizes. New Generations Service Exchange– for young people who wish to travel alone or in a group to visit another country for the purpose of humanitarian or vocational criteria. The age group is for those over 18 and under 30 years of age. YOUTH EXCHANGE– These exchanges, which are very safe, offers ages from 15 and 25 a chance to travel almost anywhere in the world and immerse themselves in a foreign culture and it won’t cost a fortune. Young people will return home full of confidence, with valuable experiences to add to a CV for both university or job applications. There are Long and Short Term Exchanges and Camps and Tours. For full details of these competitions and opportunities please click here.